50% of my profits from sales of this photograph will be donated to a Cancer Charity. Step into a spring afternoon in the Finger Lakes of New York. 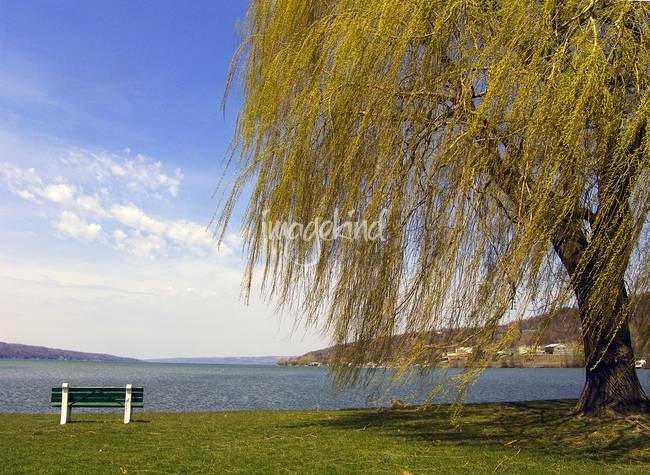 Nature's first green is the gold of young willow buds against the deep green blue of the 900 foot deep Cayuga Lake. Set among the rolling hills and gorges, this is a scene you will return to again and again. Artist note: I was lucky with this image. A flight to an adventure in the Rincon Mountains of Arizona was late afternoon, so I spent some free time with my camera and tripod. A few minutes after this shot, the scene changed dramatically, darkening with a sudden spring storm. A very nice Shot! I like this! Oh this is beautiful! Lovely composition and so peaceful and inviting. What a peaceful image. You captured gentle winds portrayed by the swaying branches of this tree very well.